PASSENGERS were never led to believe that there was much in common between the official railway timetable and the actual time that the new-fangled mixed passenger/goods train from Adelaide would arrive in Stuart, a couple of days away in the Northern Territory. So much so that on one occasion in the 1930s when it finally chugged into Stuart a fortnight behind schedule, rather than the driver, fireman, cook and guard being condemned as bungling public servants, they were actually lauded as heroes of the pioneering Outback. Because when their train had become trapped by floods in the middle of nowhere, to feed their 90-odd hungry passengers, they'd hunted down, shot and butchered wild goats. The narrow-gauge rail line from Adelaide to Stuart – that was later re-named Alice Springs – was begun in 1878, and somewhat like those timetables, was not finally completed until 1929, some fifty-one years later. Prior to the arrival of that first service, the train for many years terminated at Port Augusta, and from there passengers continued on by road to Stuart. And because the freight was transferred to camel trains operated by Afghan cameliers, on seeing dust in the distance, Outback property owners would telegraph word to others further north that "the 'Ghans are coming." 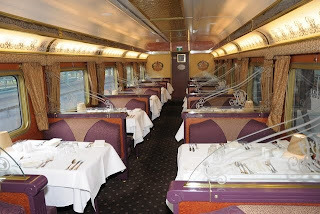 So there was little option but to dub the new train, The Ghan. The first Ghan puffed into Stuart on May 1 1929 two days after leaving Adelaide – officially on schedule because it had arrived the day it had been expected, although somewhat after the scheduled hour. And it wasn't long before The Ghan struck regular hiccups. The steel rail lines often buckled so badly in daytime 40-degree-plus heat that trains would be held up for hours until the lines cooled at night, and settled back so that journeys could continue. And drivers would report seeing rails simply parting before their eyes: voracious termites could chew through a hardwood sleeper in just days, so passengers would pitch-in with the crew to carry out emergency track repairs to get The Ghan to either Adelaide or The Alice. And kangaroos and emus – for some inexplicable reason – would gather on the line at night to be mown-down in the darkness in their scores, causing more delays. One jokester even quipped that The Ghan would often arrive at Alice Springs with more kangaroo fur and emu feathers plastered over the front of the engine than the Australian coat-of-arms. Then there was that day in the 1930s when the usually dry Finke River erupted in flood, trapping The Ghan between the raging river before it, and the countryside going underwater behind it. After more than a week, the stranded train ran out of fresh food so the driver shot wild goats: for the next five days the 90 passengers and crew sat in the train in a desert that had become a lake, dining on goat and tea for breakfast, lunch and dinner. 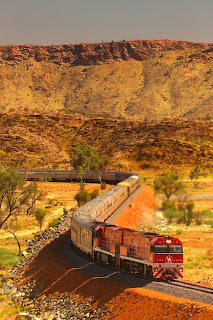 When the Ghan finally got into Alice Springs two weeks behind schedule, a journalist of the day noted: "Timetables are a matter more of hope than fact… not only is the hour of arrival indefinite, but also the day. The government-operated Ghan was sold after nearly 70 years to a private company, Great Southern Railways and in February 2004 a train made the first complete journey from Adelaide to Alice Springs and on to Darwin – over 125 years after being first mooted, and at an estimated cost over the years of $1.3-billion. The 2,979km journey takes 48 hours and is considered one of the world's great train trips, linking Australia's southern coast with its north; and today's "new" line from Adelaide to Alice Springs runs about 160km west of the original, that was closed in 1980 due to regular flooding. 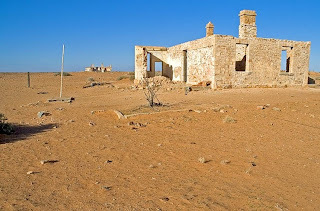 Interestingly that original line followed the route of the Overland Telegraph, that in turn had followed the footsteps of explorer John McDouall Stuart during his historic crossing of Australia from south to north in 1862. 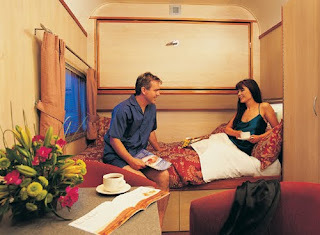 Fares Adelaide to Darwin (or v-v) start from $730 for a Daynighter Seat (online bookings only,) $1340pp twin-share Red Sleeper Cabin and from $1973pp for Gold Sleeper Cabin, with substantial CSHC/pensioners discounts available. For full details including meal inclusions see travel agents or phone 1300 657 045.